How much does a cleaning business make per year? The cleaning business profit potential is excellent on the top end of the spectrum. 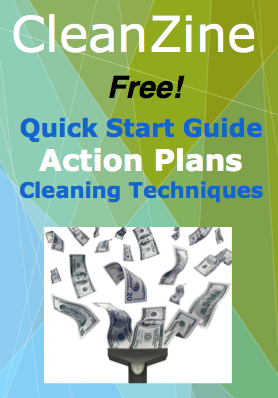 Cleaning business profits can run a range from low earning income to top earning income. It is a varied profession that spans many sectors and has a dynamic cultural context so that you will get everything from an underground economy where you may make is little as $15k per year and the professional commercial sector where you can grow your cleaning company into a multi-million dollar enterprise in as little as 10 years. Results vary! Cleaning business earning potential is largely determined by your market focus and your ability to create business systems that deliver services to that market. Creating a business plan for your cleaning service is vital in determining this. Your cleaning business profit potential comes down to scale and complexity. With residential cleaning, your overhead and expenses can be quite low, but in the commercial cleaning domain they can be quite hight, the difference is in the equipment necessary to do the job and the scale that is required and its associated up-front costs. For example a solo cleaner cleaning an apartment has very little overhead and expense because you can even use the clients cleaning solutions and vacuum, but if you are going to clean a production facility (with an office built in) you will need a floor polisher, steam machine, and a vehicle to transport both equipment and workers. Commercial sector cleaning profits are higher overall than residential due primarily to unlimited scaling and built-in higher profits due to the necessity of the service and the scale of the market. It can be difficult to scale a home cleaning company because you can only clean so many houses in a day and there is a cap on what one house will cost to clean, they only get so big. The frequency of cleaning is usually shorter and many customers in the market create a low ball estimate effect across the mainstream market. Another way of looking at it is, a bad cleaning with your home will be disappointing but it will not affect you much beyond that, but commercial cleaning failure can have big consequences for the business or professional organization, so there is less emphasis on saving money as a priority with commercial cleaning. You cleaning business profit margin will be determined by how efficient your business operations are on a day to day basis, it comes down to having good systems and a clear mission with compliance by all involved. You will need effective and malleable systems in place for all aspects of your cleaning service. Most cleaning services are rather loose with their operations, not focusing on metrics and cutting edge solutions, most of them could make much more business profit than they are. This is my experience with consulting cleaning professionals since 2004. The cleaning business sector can be very profitable if correctly approached in a detailed and focused manner, it is one the easiest businesses to start, and can achieve positive cash flow within months, which is not possible with most business niches. It is a much simpler business to run as well as compared to say a restaurant or oil lube shop or insurance agency. It is the simplicity and the age-old necessity for a clean and safe environment that makes it one of the most recession-proof businesses.